Carlton was able to secure Stephen under the father-son rule, even though he was zoned to Hawthorn. The late John Lauritz, at that time Hawthorn’s chief executive officer, rang me and asked if it was worth coming around to have a chat, but I said no. In the age of Free Agency and million-dollar a season contracts there is still room for some romanticism in the modern game. The Father-Son rule provides a link between the suburban era of the VFL/AFL and the ultra-professional sport we see today. We may be looking back at those times with rose-tinted glasses, but watching the son of a footballing hero of your youth can only give a warm sense of nostalgia. So when Jack Silvagni was drafted by Carlton at pick 53 in the 2015 National Draft, there was a sense of excitement among Carlton supporters about the continuation of a dynasty. Jack of course is the son of Full Back of the Century Stephen Silvagni, who in turn is the Son of Serge (hence the nickname SOS). Stephen and Serge played a combined 551 games for the Carlton Football Club, playing in two Carlton premierships apiece. Jack Silvagni is coming into a very different Carlton to that of his Father and Grandfather. In particular, Stephen came to Carlton at a time when the John Elliott led Blues were spending big to take up the fight to the established powers of Hawthorn and Essendon. And in only his 3rd season of AFL football (1987) he won a premiership when Carlton beat the Hawks by 33 points, with 2017 marking the 30th anniversary of this premiership success. But in his first 3 seasons, Stephen Silvagni had already experienced the ups and downs of life as an AFL footballer. Although arguably it put him in good stead to have the longevity in the game that he eventually attained. After being the VFL’s recruit of the year in 1985, expectation was high entering the 1986 season for Silvagni. However, the first half of his season was marred by illness that was eventually diagnosed as glandular fever, which also hit his liver and gave him a mild form of hepatitis. He didn’t get back into the senior side until Round 12, but did go on to play the next 13 games including 2 finals, as Carlton booked a place in the 1986 Grand Final. But with Ken Hunter returning to the side from injury, someone had to give way and that was Silvagni. He was told on the Thursday night before the Grand Final and he took it badly. But Silvagni recovered his composure sufficiently enough to help Carlton win the reserves Grand Final that was a prelude to the seniors. He then had mixed feelings watching on as his teammates lost to Hawthorn by 42 points and asking himself the eternal question of what if? Two best and fairest awards and two premiership medallions in 1988 and 1989 was Dunstall’s emphatic response. 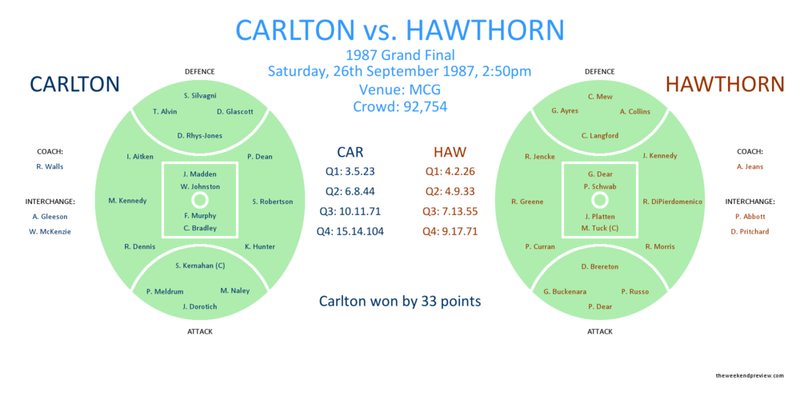 Not only were the 1986-87 Carlton and Hawthorn sides laden with talent, their progeny have proven pretty handy. For Carlton, the sons of Stephen Silvagni (Jack 21 games), Jim Buckley (Dylan 39 games) and Wayne Blackwell (Luke 23 games) have played AFL football, with potentially more on the way including Jack’s brothers, Ben and Tom Silvagni. Even coach Robert Walls had his son selected as a Father-Son (David Walls drafted in 1995) but never played a senior game. For Hawthorn, the sons of Russell Greene (Steven 42 games), John Kennedy (Josh 200 games), Chris Langford (Will 64 games) and Michael Tuck (Travis 20 games and Shane 173 games) have played AFL football. Hawthorn also has potentially more on the way, with in particular Will’s brother James Langford and Dermott Brereton’s son Devlin potential 2017 draft selections. But Hawthorn’s recent history with the Father-Son rule has not been particularly successful. Of the aforementioned players, the most successful have been Josh Kennedy (31 games for Hawthorn, and 187 games for Sydney) and Shane Tuck (0 games for Hawthorn, and 173 games for Richmond), who have played their best football elsewhere. And Will Langford, playing his 65th game for Hawthorn this week is technically not even a Father-Son draft selection as he came through the rookie list. Since the introduction of the National Draft in 1986, Hawthorn have gained the least number of games from Father-Son draft selections of any Victorian team (75 games in total) as presented in Figure-3. The Father-Son rule can be traced back to the 1940’s. However, since the introduction of the National Draft in 1986, the Father-Son rule has been continuously fine-tuned by the AFL as it has adjusted the compensation a club has had to give up for selecting a Father-Son. The bidding system currently in place is probably the best compromise between fairness and maintaining tradition. Since the introduction of the draft system in 1986, Geelong has had the greatest benefit (in terms of games played) from the Father-Son rule. In particular, their premiership successes between 2007-11 had contributions from Father-Sons Matthew Scarlett, Gary Ablett, Nathan Ablett, Tom Hawkins and Mark Blake. Collingwood, with the second highest benefit from the Father-Son rule, won the 2010 premiership with significant contributions from Heath Shaw and Travis Cloke. And then of course you have the Bulldogs of 2016. The Bulldogs had three Father-Son premiership players (Tom Liberatore, Lachie Hunter and Zaine Cordy) with a fourth unluckily watching on with a broken-leg (Mitch Wallis). Looking at the 2017 AFL landscape, the Bulldogs by far and away are currently benefiting the most from the Father-Son Rule. Using the AFL Player Ratings to assess each Father-Son player playing at their Father's club in 2017, the Bulldogs have over 1400 AFL Player Rating Points  worth of players on their list, well ahead of the competition. Although interestingly, the majority of the most experienced 2017-listed Father-Son draft selections are playing away from their Father's club – Gary Ablett, Jarrad Waite, Sean Dempster, Heath Shaw, Travis Cloke, Josh Kennedy and Tom Mitchell – with only Jobe Watson and Tom Hawkins maintaining the tradition. As much as we love the romanticism of the Father-Son rule, in the media intensive modern game does the pressure of being a Father-Son eventually take its toll? 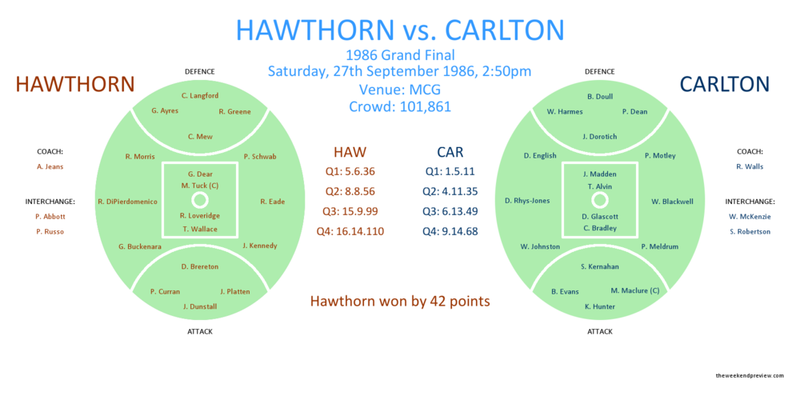 The narrow win to the Blues effectively ended Hawthorn's finals ambitions. And unfortunately for the narrative, both Jack Silvagni and Will Langford had little impact in the match. Silvagni, S. & De Bolfo T. (2002). “Silvagni”. HapperCollins, NSW, Australia. Dunstall, J. & Piesse K. (1995). “The Goal King: Jason Dunstall’s Own Story”. Wilkinson Books, Melbourne, Australia.